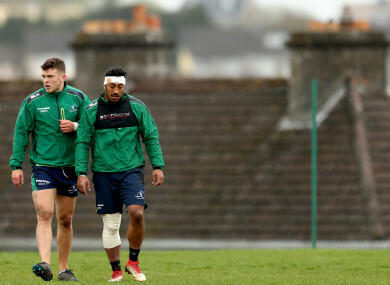 Farrell and Aki at the Sportsground for training last season. CONNACHT’S IMPRESSIVE CENTRE Tom Farrell hasn’t heard anything from Joe Schmidt and says he is just going to keep performing for Andy Friend’s side and hope a call comes at some stage. The 25-year old’s career has rocketed since he was sprung from Bedford Blues almost two years ago to solve a mid-season injury crisis that Pat Lam was dealing with at the Sportsground. “I haven’t heard anything and if it comes, it comes, but as of now there is nothing,” said Farrell, when asked if there had been any contact from the Irish management ahead of the four autumn internationals. Farrell, a former member of the Leinster academy who went across the water for game-time, initially with the London Irish ‘A’ side and then Bedford Blues, was an immediate success and pushed on last term to be a key member for Connacht. He has linked up well with Bundee Aki to form a strong centre partnership, alternating the 12 and 13 roles with the Irish international. Farrell said that Aki was a big help to him developing his game after he arrived in Galway. “He has been brilliant for me. When I first came I was prone to mistakes and sloppiness and he drilled that out with me and has driven me to higher standards and to be more accountable,” said the Dublin native. He said the move to Galway had worked out superbly and he is enjoying his rugby after the SOS came from Lam. “It’s been brilliant for me. In Bedford it was Championship rugby, it is what it is and it’s not the best standard but is a kind of springboard. It gives you that platform to showcase yourself but you have to be kind of lucky as well. Now he is a key figure as Connacht seek a rare victory in England against Sale Sharks tomorrow in the Champions Cup, but he knows they are up against it. “They have a few boys returning who are going to add strength to the team. Their position in the Premiership is not a fair indication of the quality they have. It’s a very important game and will have a big say in the group,” he added. Email “In-form Farrell credits Aki influence after making massive strides”. Feedback on “In-form Farrell credits Aki influence after making massive strides”.